The Markfield Local History Group comprises local people with an interest in the history of Markfield and how it has evolved over the centuries to become the place that we know now. We undertake a range of projects - these currently include information plaques to be placed around the village, creating a local history archive, researching the history of Ulverscroft Manor and Grange, cataloging the cemetery and writing up the histories of local men who died in the two world wars. Recently completed projects include establishing the new war memorial and producing an updated village trail leaflet. Please join us at our meetings, non-members will be made very welcome - the details are shown on the meetings and events page. Membership costs £8 per year for individuals and £14 for a family. Non-members are usually asked to pay £3 per meeting. This website is maintained by Colin Sharpe. To contact us, please speak to the above people if you know them, or send an enquiry via the Contact Us page. 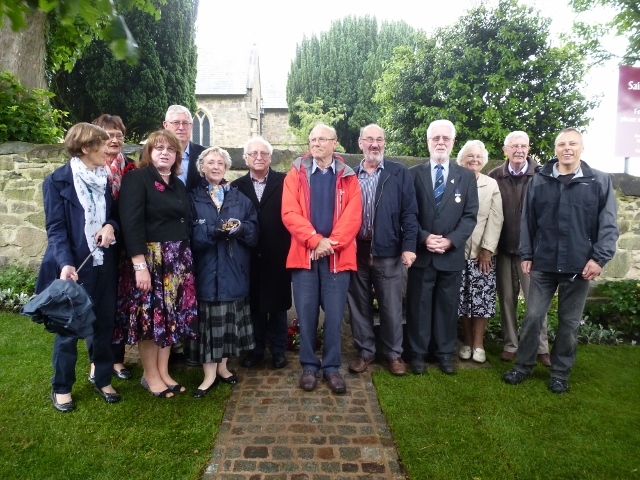 Members of the Group are pictured at the dedication of the new War Memorial in June 2014.